Scripps Media (Detroit) celebrated National Reading Day on January 23 by presenting a check to the United Way of Southeastern Michigan for $18,768 to provide age-appropriate books for children. The money provided more than 7,500 books that will be used at United Way’s family facilities. The money was raised by WXYZ-TV and WMYD-TV employees, along with a matching donation from the Scripps Howard Foundation. 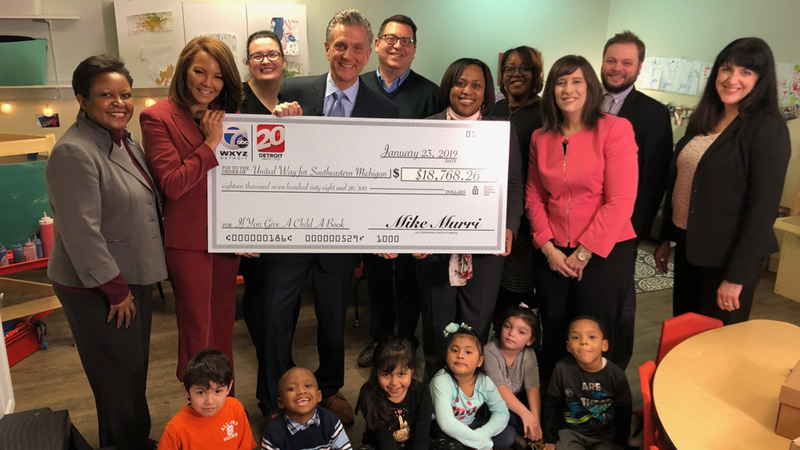 The check was presented by General Manager Mike Murri, anchor Carolyn Clifford and WXYZ and WMYD employees, along with a matching donation from the Scripps Howard Foundation. Educators have long said reading makes people smarter, and there’s research backing them up. A recent study conducted by the American Academy of Pediatrics found reading to children of any age wakens a number of regions in the left part of the brain. The areas in the brain that become active involve understanding the meaning of words and concepts tied to memory. Last year, a Detroit organization received a surprise donation on National Reading Day. The Scripps Howard Foundation donated $10,000 to help kids at the St. Vincent and the Sarah Fisher Center.